Time after time, Susan Rice is proven to be a liar. She lied about Benghazi being caused by a YouTube video, Bowe Bergdahl serving with "honor and distinction," and that Obama got Syria to "verifiably give up its chemical weapons stockpile." All lies. But worst of all is the fact that she lied about spying on Donald Trump and his team during the campaign. She admits to the spying, but claims it wasn't political. It's been a whole week since this news broke and Congress has done nothing. Not a single subpoena was served. They are letting Susan Rice walk. Send your FaxBlast to Congress and FORCE them to subpoena Susan Rice, force her to testify, and if necessary, refer her crimes to a grand jury! Susan Rice lied about Benghazi. Instead of admitting - during the 2012 Presidential campaign - that Americans were killed during a terror attack, she perpetuated the lie that it was a spontaneous response to an amateur YouTube video. This maintained the politicized narrative that Obama was strong on terrorism. When it became known that Obama had ordered a prisoner swap with the Taliban to save a US Army deserter, Susan Rice again took to the Sunday shows and claimed Bowe Bergdahl “served with honor and distinction.” Even though the government’s own report indicated he went AWOL and may have actually sought out the Taliban, Rice spun it to save Obama from ridicule. After Obama refused to enforce his red line in Syria, Susan Rice declared on television that Obama's skillful negotiations "were able to get the Syrian government to voluntarily and verifiably give up its chemical weapons stockpile." The dead and wounded from this week's gas attack prove that was a lie. And now, we arrive at the issue of unmasking surveillance and spying on Donald Trump. At first, Susan Rice declared she knew "nothing about this" scandal. Then, when the evidence began piling up, Rice admitted that she was at the heart of the scandal but swore it wasn't political. Let's get this straight... She politicized the response to a terror attack against our consulate that killed 4 brave Americans; she politicized the talking points about Obama's decision to negotiate with terrorists, claiming that an Army deserter "served with honor and distinction; she lied about getting Syria to turn over its chemical weapons in order to help Obama save face after refusing to enforce his own red line; and now Susan Rice is claiming that she spied on the Republican nominee and President-elect but that there was nothing political about it? 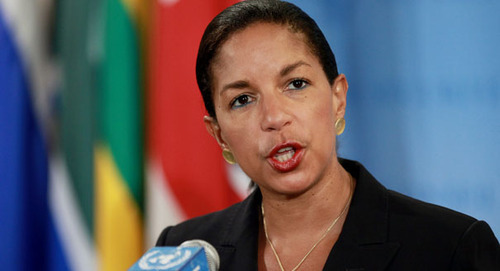 Susan Rice has made a career of injecting partisan politics into National Security roles. She even infamously advised against intervening in the Rwandan Genocide for fear that it would hurt Congressional Democrats in the midterm elections. Susan Rice spied on Donald Trump. She requested the unmasking. The law says that unmasking can only occur to fill an "intelligence need in the American interest." As National Security Advisor, Rice was a consumer of intelligence, not an investigator. She literally was not capable of making such a determination, and yet she requested it anyway. It has been a week since these allegations came to light and Congress has done nothing. This is unacceptable. You must subpoena Susan Rice to testify. You must question her under oath. You must call as many Obama officials into hearings as necessary and if there is evidence of crimes, you must refer them to a grand jury. Not in two weeks. Not in a month. Now!